Is it a ring or an architectural masterpiece? Ascend to a new level of style. This ring is crafted in polished 18K white gold, and features one pear cut 19.0 x 16.5mm amethyst stone in a prong setting at the center. 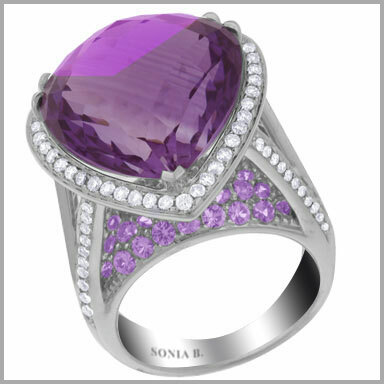 Feminine light is created with the backdrop of 66 round cut 1.7mm pink sapphires in prong settings. The design advances upward with amazing height and is kissed with the brilliance of 83 full round cut diamonds.